Courage is the ability to look at fear in the face and proceed with a predetermined action or plan. How far people go in life is often a function of how they are able to deal with and overcome difficult or dangerous situations. 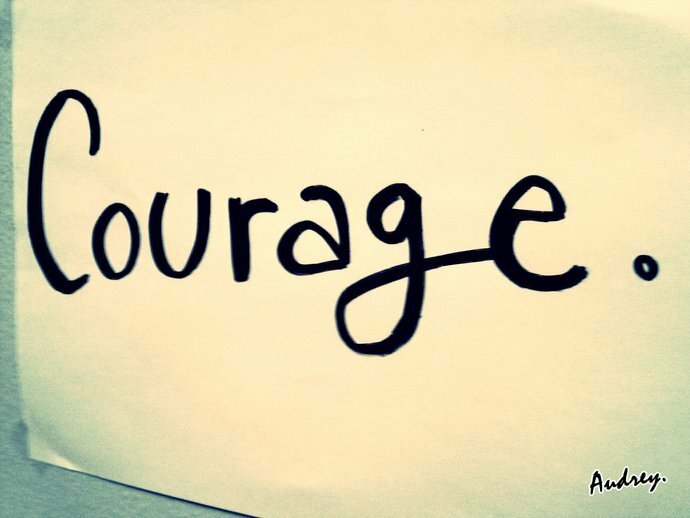 Courage helps you stand up for what you believe, follow your intuitions and abide by your convictions. It helps you to step out when you need to in order to pursue something that can bring you happiness and fulfilment. People with courage are far more likely to succeed in business than those who do not have. Nelson Mandela, while commenting on courage said “I learned that courage was not the absence of fear, but the triumph over it. The brave man is not he who does not feel afraid, but he who conquers that fear”. Many people have had great ideas for years but have lacked the courage to step out there and try it out. There are several others who are unable to pursue their dreams for fear that they will fail. Their minds make up imaginary reasons why the idea will not succeed. Fear overcomes and numbs their ability to think of a way out of the situation. Faced with a life threatening situation, some people actually die before their real death. There are others who perpetually live in fear of failure, dying or the fact that someone is after them. In the end, what separates successful people from those who fail is a function of how they are able to resolve difficult situations. There are some names that readily come to mind when we consider people who have displayed exceptional acts of courage in dealing with difficult situations. There are also others we may never hear of and whose names never make it to the pages of newspapers but who daily show tremendous courage on the battlefields fighting to keep our lives and country safe. Let us examine the amazing story Juliane Koepcke, a seventeen year old girl who survived a plane crash and walked out of the Amazon. Juliane’s story proved that sometimes, all it takes to survive is extreme courage. On the eve of Christmas in 1971, Juliane Koepcke and her mother boarded a plane in Peru intending to travel to meet her father at his research station in the Amazon rainforest. The plane was struck by lightning and destroyed a wing which caused the plane to crash. All 92 passengers on-board died, but Juliane stayed strapped to a row of seats, falling until she plummeted through the jungle canopy. Somehow, she survived the fall but sustained major injuries. When she did not find her mother or any other survivor, Juliane relied on what she had been taught by her parents. She grabbed a bag of candy she had found and started walking down a stream. Her father once told her that walking downstream will eventually lead to civilization, and for 10 days Juliane walked or floated through the water. Her wounds became infected and she was besieged by maggots, while having to dodge crocodiles, insects and other dangerous sea animals. She found the corpses of the crash victims as she went, making sure each wasn’t her mother before continuing on. Eventually she came to a shack and a boat. Not wanting to steal the boat, she holed up in the shack and was found by Peruvian lumberjacks. She was eventually reunited with her father. In the words of Martin Luther King, Jr., “the ultimate measure of a man is not where he stands in moments of comfort and convenience, but where he stands at times of challenge and controversy”.